"This ship is a result of the Engis' fascination in both paint and creativity. Starting with a basic reactor, this ship relies on its teleporter and funky weaponry." Below is the download link and below that is a history of my work on this ship, and below that is the changelog. What were the design choices you had in mind with this ship? I mean seriously what is this? A teleporter that doesn't make sense with this crew? Uh-huh. What started as wanting to re-color the Engi B quickly faded into me embracing my creative self and just going for it, meshing blend fill around every single piece of the Engi B. In there among other things, is an actual blend reminiscent of the chameleon coloring on the TVR Tuscan Speed 6. Anyways, I am kind of amazed at how I pulled all that off. For some reason, recently modding revitalized within me, and I figured I already had done most of the ship that I better finish it correctly. The ship image, layout, system placement, cloak, cloak room system glow, crew was finalized. What was left to do was to figure out what systems and how much power -- what the strategy of the ship should be. Originally, I had intended the weapon setup to be a corrupted/slow combat drone, a basic laser with high fire chance and a teleporter. The teleporter is still there mainly because I couldn't resist how cool it looked next to the medbay (I have a soft spot for 3x1 rooms). With this ship when the question Why? is asked I have the liberty to say just 'cause it's surreal. everything that seems to be normal is completely flipped around, which is why I finally decided to release this. Have fun! Some design choices I had forgotten about from before I just rolled with because I might've had some reason for them and this ship is well, this ship, so I just went with it. I removed drone control because, while I liked the drone's function, I didn't like forcing drone control to be a system. When I went drone control, there was a way to defeat single shield bubbled auto drones, and when I removed it, I didn't want that to be lost, so those weapons are what they are because of this. After hearing the feedback about the loopy doors, they're now removed. I tried changing the loopy doors to less loopy doors, but the one bug remains with loopy doors -- even with a single one, crew passing through the door going to some destination will make it seem like there are more, because it messes with that order you give to the crew. So instead, I changed the layout to something else, different now, as you can see in the image at the top of the post. In addition, I fixed some other things which you can find out about in the change log below. Enjoy! and decided on how good the weapons should be, noticing that getting through only 1 shield is not good enough. 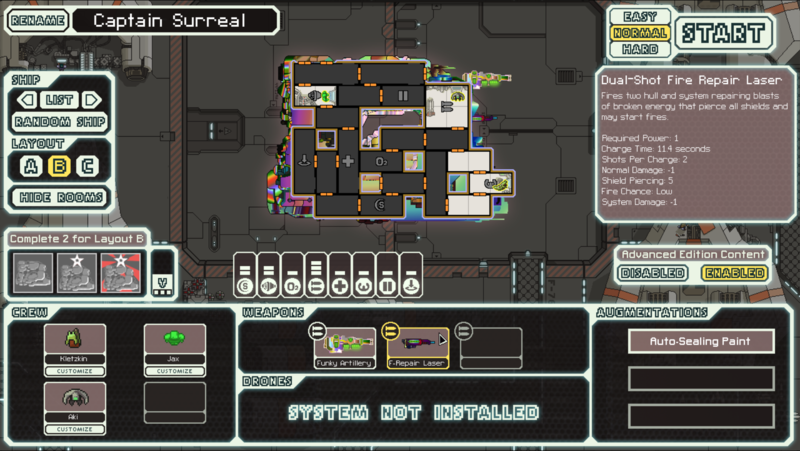 FTL: Captain's Edition by Sleeper Service, found here: https://subsetgames.com/forum/viewtopic.php?t=15663, is licensed under the Creative Commons Attribution-NonCommercial-ShareAlike 3.0 Unported License. To view a copy of this license, visit https://creativecommons.org/licenses/by-nc-sa/3.0/. Last edited by mr_easy_money on Sun Oct 08, 2017 7:52 pm, edited 15 times in total. Nice, the mod incorporates some interesting ideas and the ship looks pretty sweet. Well done! A long while ago, I was wondering if someone could design a ship that was ugly yet functional. And not just "Big box with guns" kind of ugly but more like "Fashion Faux Pas" where the colours seemed to be all wrong and all that. And I can't just go and board them because the crew isn't suited for it. I know that's the gimmick of the ship but honestly... what are you supposed to actually be doing? 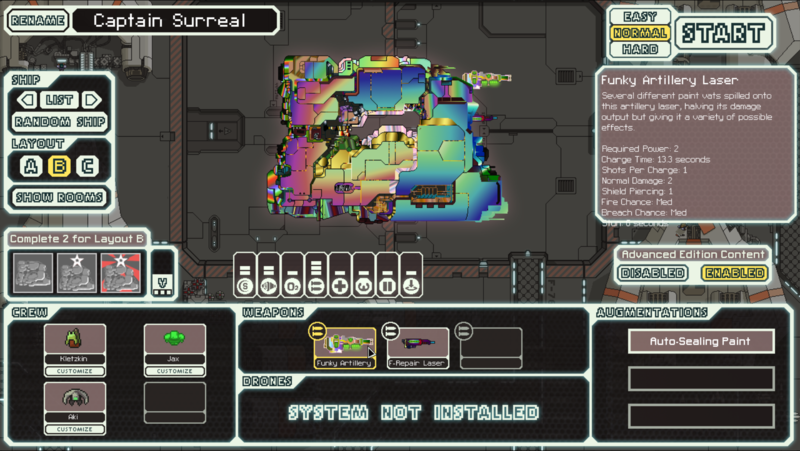 Yeah, considering what was thrown at me and how underpowered the ship was, I was not going to restart. I need something with a real gun. Sorry mr_easy_money but it's just not a viable ship and I don't know how you can make it more powerful without removing the gimmick. stylesrj wrote: Yeah, considering what was thrown at me and how underpowered the ship was, I was not going to restart. I need something with a real gun. This is why you need to playtest the ship yourself before putting it out there. It sounded good on paper but in practise, the weapons combo is bad. 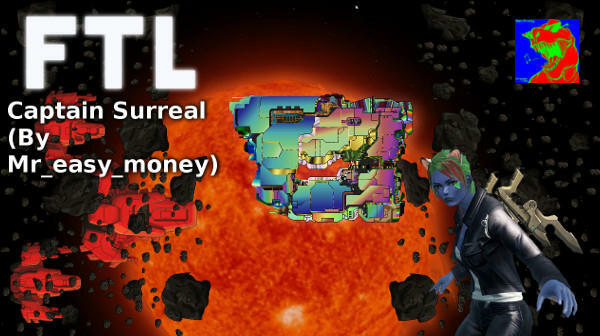 stylesrj wrote: This is why you need to playtest the ship yourself before putting it out there. It sounded good on paper but in practise, the weapons combo is bad. I've changed the weapon combo from that crappy gimmick to something with a lot more kick. Details can be found in the changelog and the new main post images. also, I changed the title to incorporate the word "beta" as I have a feeling it might have way more kick than needed, so more changes may be made, and then there will be the full release starting at v1.0, as right now without beta it looks like there has been a ton of progress.